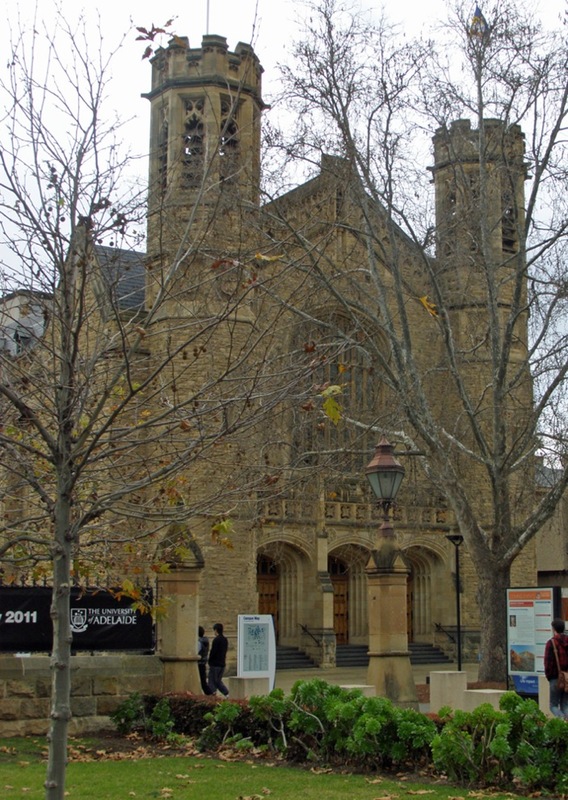 An image of Bonython Hall at The University of Adelaide in South Australia. Bonython Hall is a neo-gothic building that was constructed from Murray Bridge limestone between 1933 and 1936. The entrance facing North Terrace features three large lancet-arched doorways, a late-gothic perpendicular style window and intricate stone-carved decorations including blind arcading on the gable, the quatrefoil patterns above the doors and the two lion statues bearing heraldic shields. It is flanked by two large octagonal towers that are also decorated with carved heraldic shields, arrow-slit windows and crenellation. The construction of the Hall was funded by a donation of £50,000 from Sir John Langdon Bonython, who was a prominent South Australian benefactor and a member of The University of Adelaide Council from 1916 until his death in 1939. The building houses a ‘great hall’, which is used for ceremonies and large functions such as graduations, examinations and public lectures. 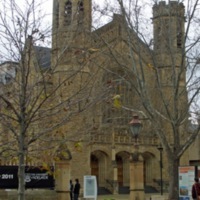 “Bonython Hall, The University of Adelaide,” Medievalism in Australian Cultural Memory, accessed April 25, 2019, http://ausmed.arts.uwa.edu.au/items/show/457.